This one took me some time to complete with the help Biswas, Pushpendu , so I have to give him the credits. We just deployed Exchange 2007 and did not have time to stand up ISA (Politics) . Anyway without ISA we open up the CAS to the SSL from outside world( security people must be horrified now (-: ). And make sure there is no further configuration is needed, OWA virtual directory needs to be un-touched. I have co-existance envt. of 2003 and 2007 and need to access to OWA/exchange without forcing users to learn one more website. I want that web mail(2003) will automaticall redirect user to their new url if it has a mailbox on 2007. 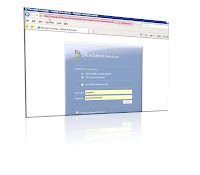 We have http://mail.domain.com for x2003 and http://email.domain.com for x2007. Now when user is trying to access his mailbox thru http://mail.domain.com while being his mailbox on 2007 it is forwarding to next page with error message "There is a problem with this website's security certificate" and if you click "Continue to website(not recommended" it will take you to right one. My question is is there any way we can get rid of this middle error page..? Did I mention we do have SSl for this new site and server. And this is for internal access. It may sound confusing but please feel free to ask if u need more clarification. Thanks in advance.